It takes all kinds! And if you’re a car guy or gal, you know that sometimes there are “special” people in our hobby. The original owner of this 1967 Corvette was one of these folks, and you’ll soon have your chance to buy this C2 at Mecum’s auction in Houston this weekend starting tomorrow through April 12th. 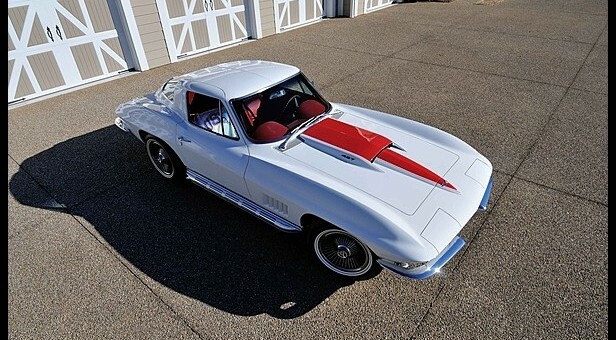 Looking at the photos, you can see this 1967 Corvette coupe has a lot of things going for it: big-block 427, gorgeous red-on-white-on-red trim combo, and is unrestored. But then take a gander at the odometer and you’ll see that this Vette has under three-thousand miles. Huh? Is that even possible? For Don McNamara of Colorado Springs, it was. Seems he was a 30 year-old Marine celebrating his retirement with a trip to Las Vegas when he won a $5,000 jackpot in the slots. He gave the money to his dad, a car salesman, and told him to find a Corvette. It is reported that Don babied the Corvette for a few months, and then it dropped off the face of the Earth. Friends would ask about the Corvette, but Don was always vague about still owning the car. Upon his demise in 2011, the Corvette was found in his garage. His neighbors of 22 years had never seen it all that time, but they were not surprised because, according to Mecum’s website, Don never married or had a family, had no checking account or credit card, and always presented himself as barely getting by. Eventually it was discovered that paperwork was kept in a bank safe deposit box, including the original window sticker, showroom sales brochure, Chevrolet warranty book with Protect-O-Plate, the original keys and fob, the original owner’s manual and plastic pouch, dealer record book, a cashier’s check for a deposit plus receipt for the balance of the purchase price, and the original State of Colorado license registration and title dated May 22, 1967. Certainly it doesn’t hurt this is an authentic 427 car with the L36 390 horsepower (the lowest of the big-blocks of the time). Other features are M20 wide-ratio four-speed, 3.36 Posi rear, telescoping steering wheel, AM/FM radio, Kelsey-Hayes bolt-ons, and sidepipes. Perhaps “special” is a patronizing term for someone who’s a little different, but Don certainly left a special car for the rest of us to appreciate . . . and a one lucky collector to own. That beautiful Stingray deserves to be in a museum. I am worried that someone who wins the auction will destroy it!